Not only the Hastas but also the Postures in Bharata Natyam are vital in depicting a particular situation, nature or condition or a character. 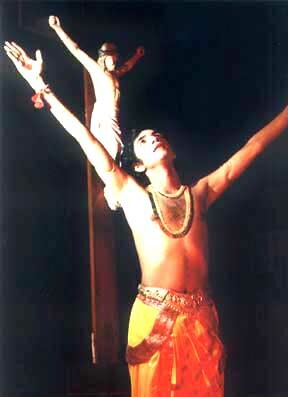 With the same principle, keeping in mind the technique of Bharata Natyam, Christian Theology and the Gods of Indian aesthetic I constructed new postures for the crucified Christ, the Risen Christ, Mother Mary etc. here a particular posture had to suit the theme, Christian theology and artistic correspondence with the message and the personality to be depicted. For example: posture for the crucifixion of Christ. Posture for the Crucifixion of Christ. The posture for the Crucifixion of Christ is conceived as follows: the right leg is placed on the left and the whole body is lifted a little higher putting the whole weight on the front part of the leg. The body is held straight. The hands are held 45 degrees higher from the shoulder level in Ardhachandra hasta. In the hasta viniyoga, Abhinaya darpanam gives the use of Ardhachandra for prayer. According to Christian theology, Christ's crucifixion was the supreme prayer and sacrifice. This posture explains the meaning and significance of crucifixion symbolically and in a very aesthetic manner. Resurrection of Christ, according to Christian theology is the victory of Christ over sin and death (refer 1 Col. 15:). The posture for resurrection is depicted keeping in mind the above significance. The body is held up by keeping the full weight on the right leg and left leg is placed just above the ankle of the right leg. This is to signify that Christ is the one and only principle of creation and the first born of the dead, so likewise, he is the principle of new life initiated by his own resurrection (Gal. 1:18); the head is held erect which denotes a victorious Christ. The right hand in Ardhpataka is held above the head, (normally to depict Jesus Christ, this particular Hasta is held parallel to the shoulder) to signify that the resurrection of Christ is not a return to the condition of the present life, but to a life of the Spirit, the life already possessed by the Risen Jesus and communicator to those who come under his protection (1 Co.15). The left hand in Sikara signifies the victory of Christ over ego, evil, sin and death. Several passages connect the resurrection and exaltation with the title of Lord in such a way as to suggest that christ fully possesses the title through His Resurrection and Glorification. (Rom 10:9, 14:9; Eph 1:21; Phl 2:7-11; Col 1:18).